Reno, Nev. Nov. 22, 2017. The Second Judicial District Court is proud to announce that District Court Judge Scott Freeman was unanimously elected Chief Judge by his peers on November 17, 2017. Chief Judge Freeman graduated from Ithaca College in New York with a degree in politics and a minor in economics. He received a juris doctorate degree from Southwestern University School of Law in Los Angeles, California. Chief Judge Freeman has been a resident of Northern Nevada since 1979. Prior to his judicial appointment in 2012, Chief Judge Freeman led a distinguished legal career with an emphasis on advocacy for individuals accused of crime. His zealous representation and astute awareness of key legal issues are evidenced by the numerous awards and recognitions he received during his 28 years in private practice. 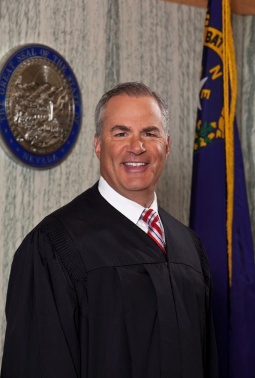 Additionally, Chief Judge Freeman formerly co-hosted the weekly television show “Lawyers, Guns & Money” on KRNV TV, an NBC Network affiliate, with an interview format focusing on notable personalities in the legal, cultural and charitable communities. Chief Judge Freeman is most proud of his work in the community. He has served as a member of several local boards aimed at enriching the lives of Northern Nevadans. Included among them are the Children’s Cabinet, Rotary Club of Reno Sunrise, International Special Olympics, and Reno Rodeo Association. The Second Judicial District Court was established in 1910. District courts are courts of general jurisdiction where civil, criminal, family and juvenile cases are decided. The Chief Judge presides over a court with 14 other district court judges, in addition to commissioners, court masters and the Washoe County Law Library, as well as a staff of 170 full-time employees. The Chief Judge term is for two years. To learn more about Chief Judge Scott Freeman, please visit the District Court’s website at www.washoecourts.us.